16th July 2018: This post has been updated at intervals over the last week. Note that larger versions of all photo’s can be viewed by clicking on them. Terry Smith’s modified Custom Brass SR&RL #18 hauling freight cars uphill while on test. 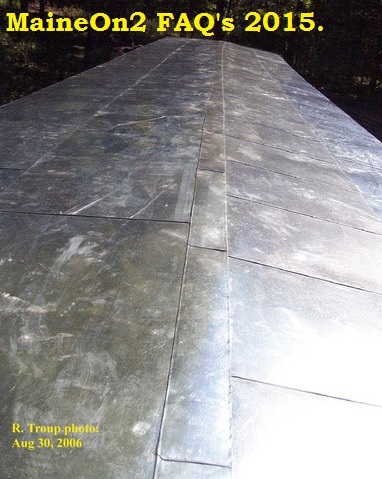 Note the packing on top of the left hand trestle to raise one end of the temporary board. At the start of August 2005 on the MaineOn2 Yahoo Group, a thread started about grades. The discussions between Walter Orloff, Terry Smith, Peter Tuttle and Trevor Marshall (and others) are summarised here for the insights they provide. This is one of those classic questions for which the answer is “it depends”. 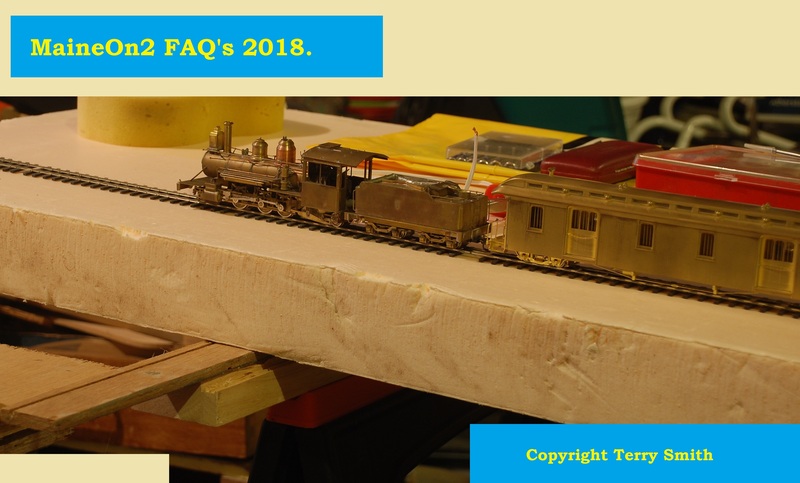 It depends a lot on what locomotive we’re talking about, how well your particular model of it was built (brass is hand-built, so each one has the potential for its own unique blend of operational problems), how well your particular model has been tuned, the quality of your trackwork, etc. 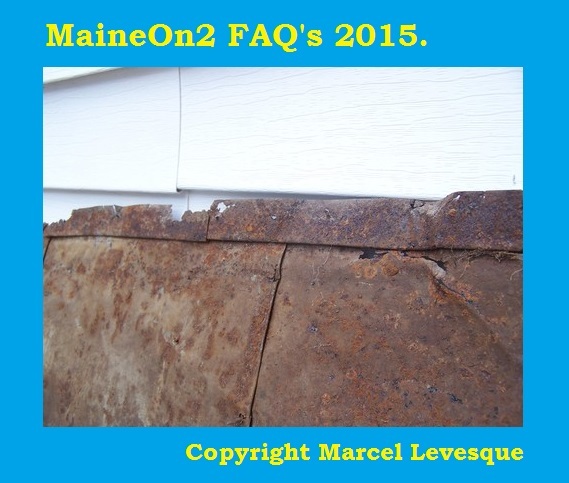 Other factors also have to be considered, the rail material you are using, and material your loco drivers are made of, this determines the coefficient of friction between the two materials, hence slippage The rail cleaner you use can increase slippage. So the short answer is, the best way to determine this is to do tests with your own models. If you plan to pull any brass cars (cabooses or passenger cars come to mind) be warned that they could severely limit your grades. 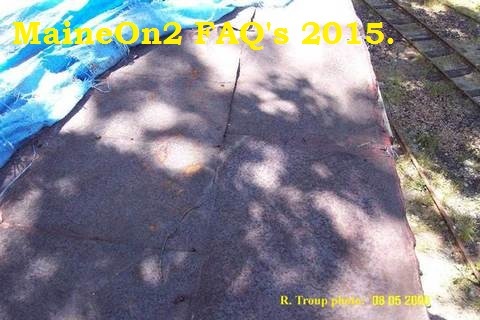 FAQ authors note, no track grade does not necessarily lead to a flat layout. 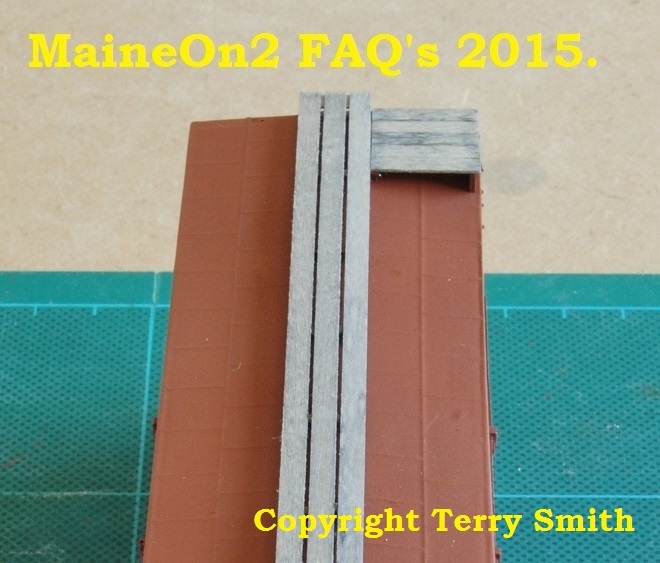 Trevor’s approach – I’d like to be able to pull passenger trains with 3-4 cars for the occasional railfan trip, camp special, or running of the S&PCRR’s premier passenger train, “The Rusticator”, so I’m building my layout with a planned grade of ZERO. I’m sure that’s not the answer you’re looking for, but it at least explains why I’ve decided to not introduce grades on my layout. My advice – build some track – straight and at your minimum radius – on a portable board, prop it up to various grades (which you can calculate by using rise over run), and then pull some equipment with your locomotives and figure out what works for you. This picture shows a temporary set up assembled by Terry Smith in his garage in order to demonstrate the PFM Sound System to a friend. 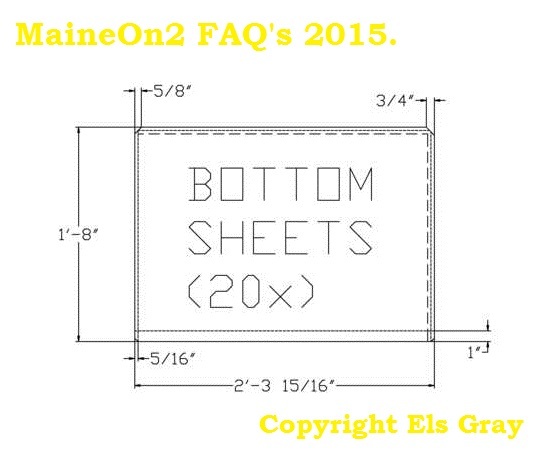 As will be seen, it is very easy to convert to grade test rig. 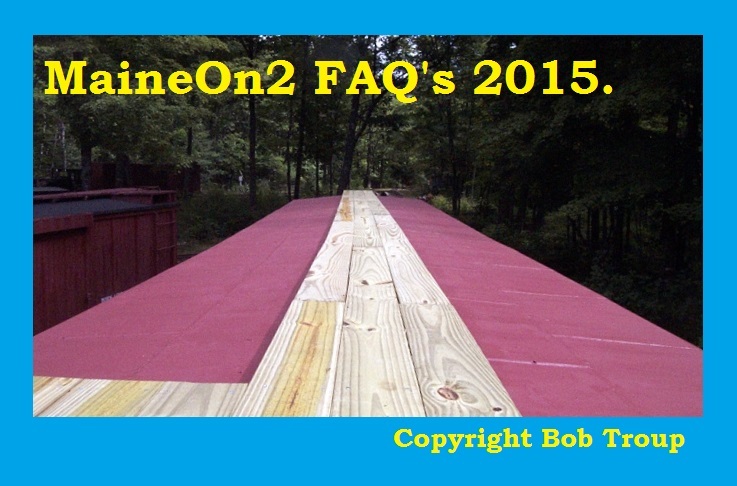 The board is a 3″ thick slab of foam insulation board supported on two folding trestle supports. Terry Smith‘s experience – I tested each of my locomotives for haulage capacity on the flat, round curves and up and down grades. 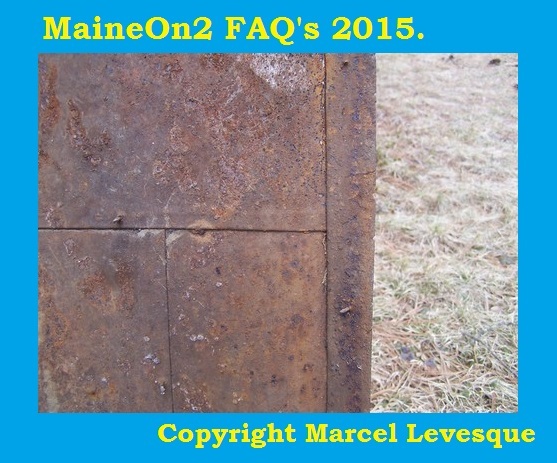 The first tests were done with freight cars. Most loco’s could pull 6 or 7 boxcars built from SRCS kits with Grandt Line trucks and NWSL wheels. 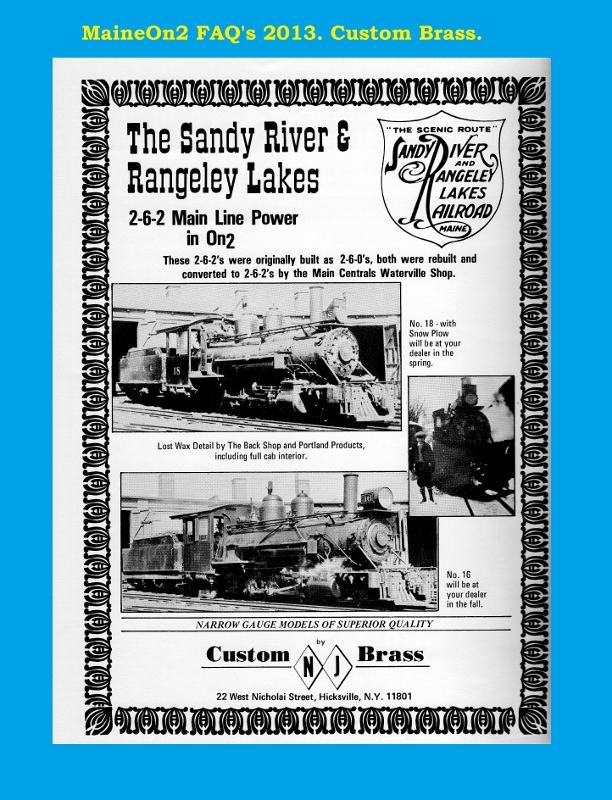 The bigger engines like the Sandy River Prairies and the Bridgton 2-4-4’s #7 & #8 could handle 10 boxcars (all that I had running at that time). The track was Precision Scale flex track with code 70 nickel silver rail. The tests originally showed me that the units tested could still pull a reasonable train up a 2% grade without too much slipping or other problems and my first iteration of my P&SR layout was designed with these figures in mind. …………………………………….And then it all changed!. 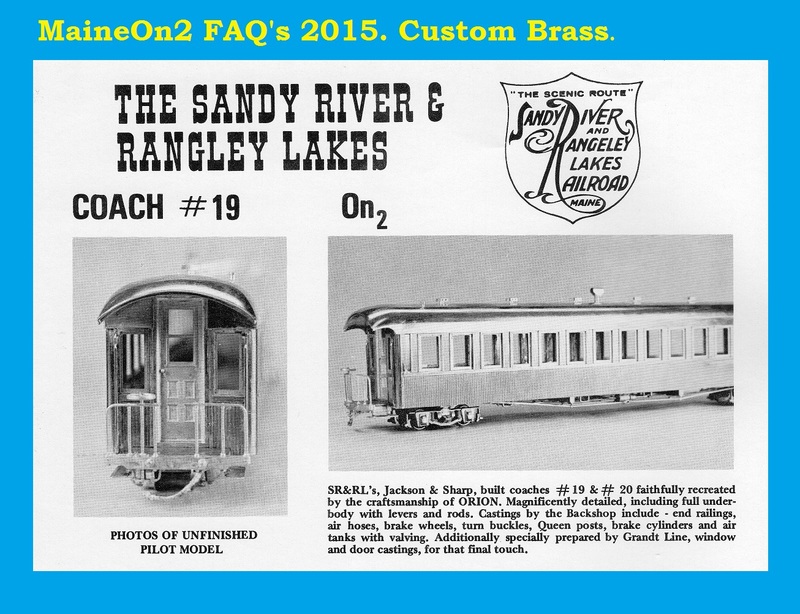 I started using a PFM sound system, and had bought a set (#15/#16/#31) of The Car Works Bridgton coaches/baggage cars. Because of the sound system, I found that I needed to clean the track to avoid spurious sounds/signals etc. I ended up using Goo Gone, which is a fabulous cleaner, but the trains could no longer manage the 2% grade, so the P&SR was re-jigged to become as perfectly flat as realistically possible. 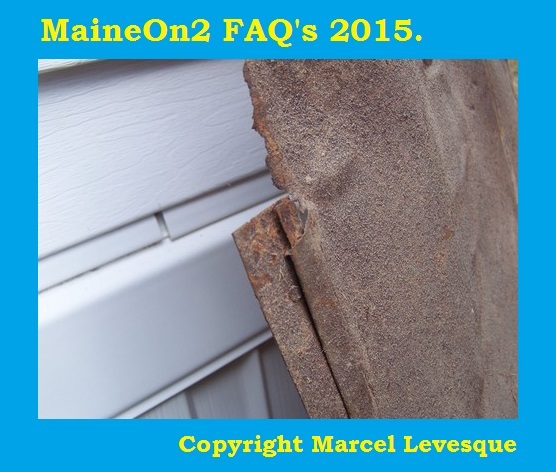 It is only through discussions on another board that I have recently learned that rails should not be cleaned with Goo Gone as it leaves a deposit which is slippery. 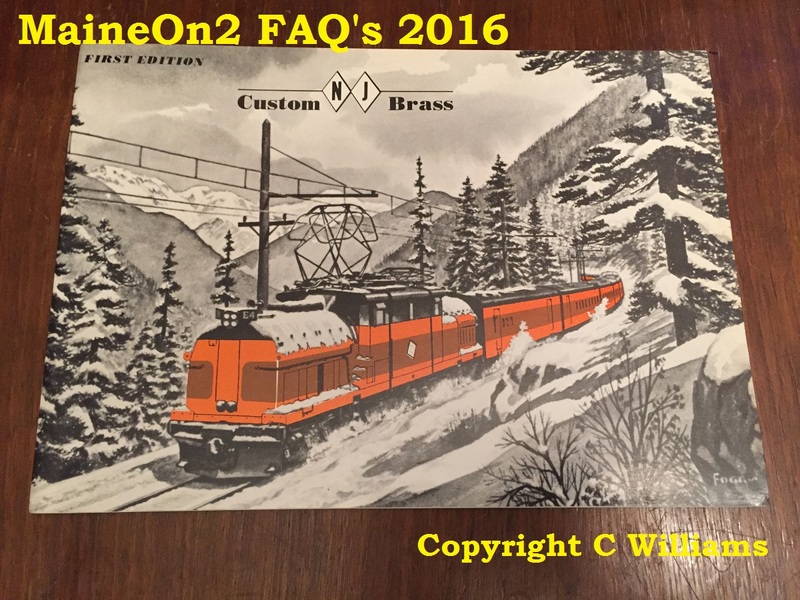 A pal of mine uses Rail Zap, and I have a sample to try, maybe more later. 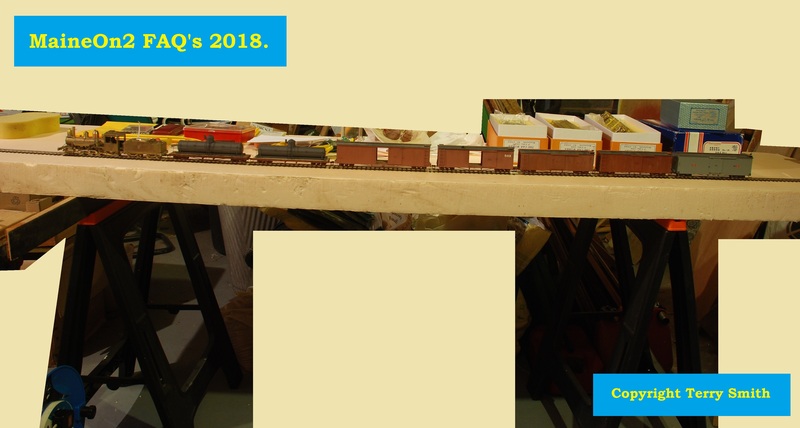 The F&M #1 weighs 370 grams, so in total it was lifting around 715 grams up a 2.3% slope (based on average freight cars) and 1074 grams of passenger cars and loco up a 1.3% slope. 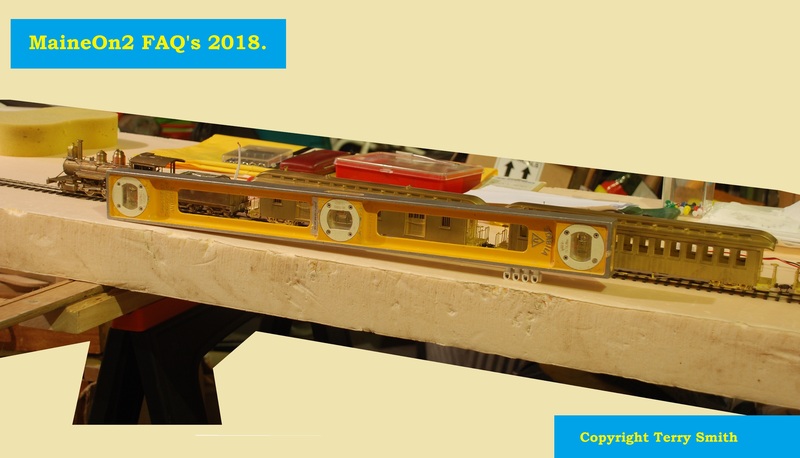 The B&SR #7 weighs 548 grams, so in total it was lifting around 893 grams up a 3.1% slope (based on average freight cars) and 1252 grams of passenger cars and loco up a 2.7% slope. F&M #1 model by Portland Products, no modifications at test, except well run in. B&SR #7 model by Car Works, no modifications at test, very little running. Two coaches would be two from The Car Works B&SR #15, #16, #31. Three freight cars would be SRCS kits equipped with Grandt Line Trucks and NWSL wheelsets. Freight cars in P&SR layout running condition weigh between 75 and 155 grams. The calculated total weight of the three most likely freight cars based on average weight is 345 grams (12 ounces). Track used was Precision Scale flextrack with code 70 nickel silver rail. SR&RL #6 hauled a coach and combine up a 3.6% grade. SR&RL #18 hauled two coaches up a 3.6% grade. SR&RL #6 hauled two coaches and a combine up a 2.04% grade. SR&RL #18 hauled two coaches and a combine up a 2.9% grade. SR&RL #6 hauled six freight cars up a 3.6% grade. 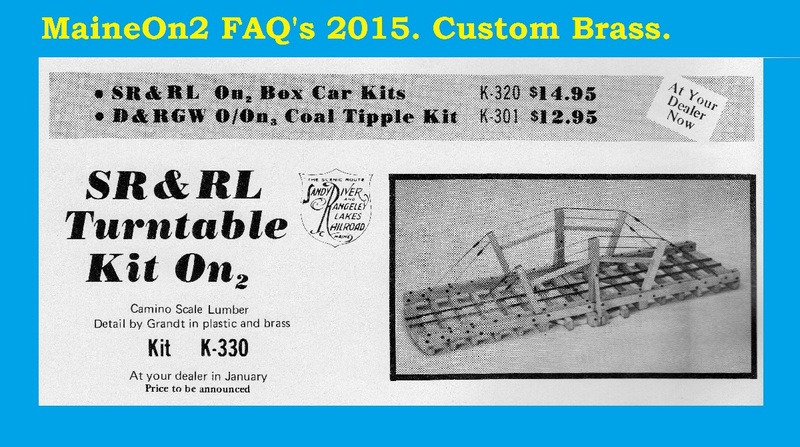 SR&RL #18 hauled seven freight cars up a 3.6% grade. 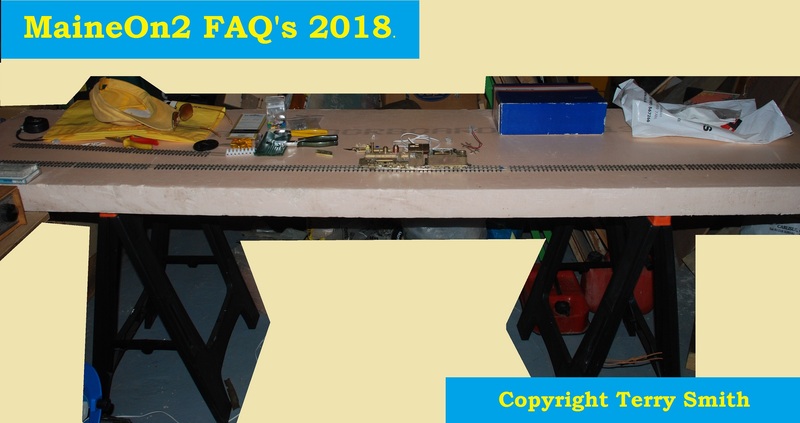 Amount of slip/wheel-spin allowed on test: I allow a minor amount of locomotive driver wheel slip when starting the train on the inclined test board, but do not allow wheel-spin once the train is moving at a steady pace. This is judged by eye, so it may be somewhat variable in terms of accuracy and reproducibility. I recorded the weight of the train of freight cars that the loco could pull up the grade slope, which was 692 grams (6 cars) and 798 grams (7 cars). The passenger coaches weighed 352 grams and the combine weighed 364 grams. The modified SR&RL #6 weighs 474 grams, so in total it was lifting 1166 grams up a 3.6% slope (freight cars) and 1190 grams of passenger cars and loco. 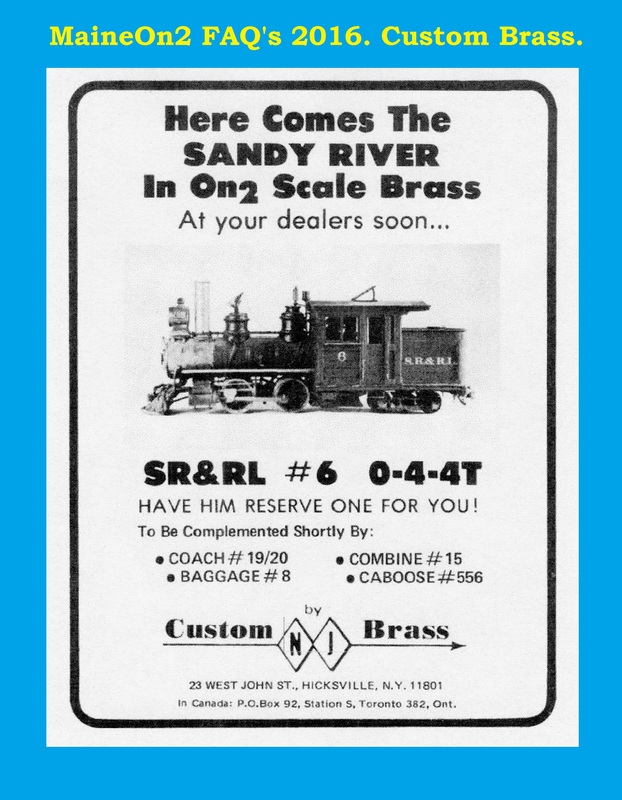 The modified SR&RL #18 engine only weighs 500 grams and its tender weighs 184 grams, so in total it was lifting 1482 grams up a 3.6% slope (freight cars) and 1388 grams of passenger cars and loco. The Custom Brass SR&RL #6 tested above has been re-motored with a Faulhaber 1624 coreless motor driving through the original gearbox, and has the OEM boiler weight modified to add more weight over the drivers, as well as extra lead in the boiler. Additional power pickups have also been added. The Custom Brass SR&RL #18 also has the same 1624 Faulhaber coreless motor, but in this case it is married to an RG4 gearbox fitted to the rear driver axle. The PFM Sound System fitted has an on/off switch allowing the loco to run as a non-sound loco on conventional controllers, and it was slope tested in this configuration. The foam board set up is easily converted into a grade test rig by adding packing on top of one of the trestles, as shown here. Rather than relying on measuring the height of the packing, Terry prefers to use a spirit level with a shim piece (electrical connector block used here) to determine the true grade. The level is levelled by moving the shim piece, and the height of the end of the level above the board is measured by a ruler. Dividing this height by the length of the level gives the grade. In this picture Terry’s modified Custom Brass SR&RL #18 hauls a three car passenger train uphill. 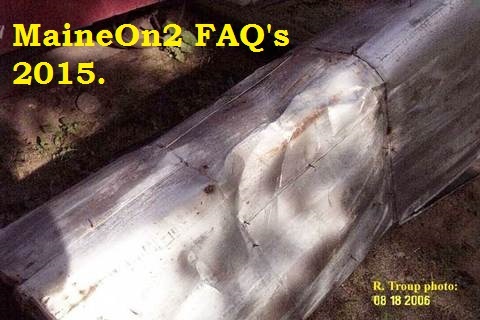 The topics of locomotive drawbar pull and truck friction are related to the maximum grade capability, and have now been published on these FAQ’s is a separate topic. Click here to view on another page. Text corrections: 03- July-2018. Text additions and photo’s added: 09- July-2018. Further additions and presentation changes 11, 12, 13, 16 & 24 – July – 2018. 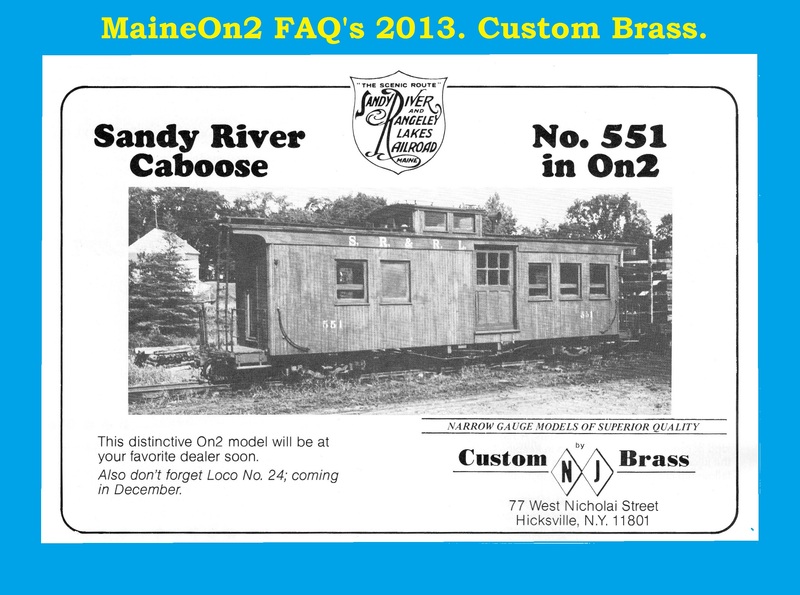 This fabulous model of a small Maine Two Foot Forney style loco resulted from a collaboration between Bob Werner, proprietor of the Hobby Barn and Portland Products and Peter Barney, then proprietor of SRCS (Sandy River Car Shops). Machined parts were produced by Steve Earle and most of the 41 units produced for sale were assembled by noted Two Foot modeller Mark Hall. It is believed that Bob Werner may have assembled the final three units offered for sale. 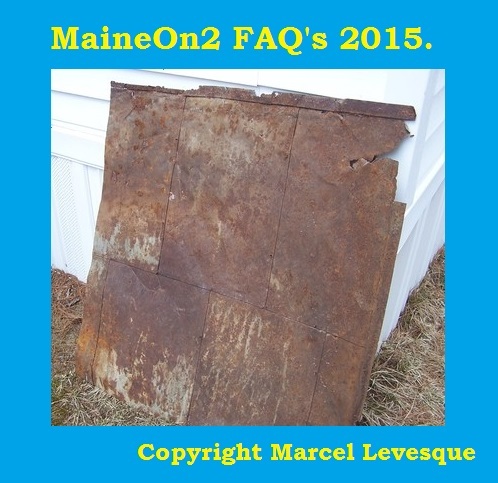 The F&M #1 was intended to be the first in a line of small Forney’s produced domestically within the USA, continuing with models of Monson #1 & #2 and Bridgton #1 & #2, if there were sufficient orders. Peter Barney advertised the model availability in his SRCS Newsletters in the 1986 to 1989 timeframe, and referred to the collaboration as “The Forney Co.”. Some models were sold in white SRCS boxes, labelled “The Forney Co.” and incorrectly describing the model as “F&M #2/#3”. 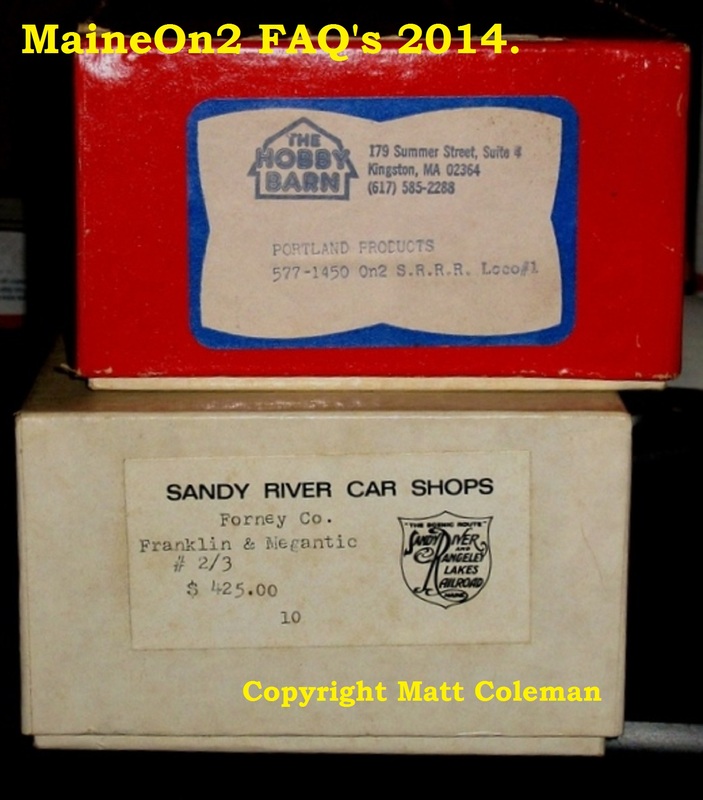 Bob Werner sold some models in red boxes labelled “Portland Products, a division of The Hobby Barn, and correctly describing the model as F&M #1”. 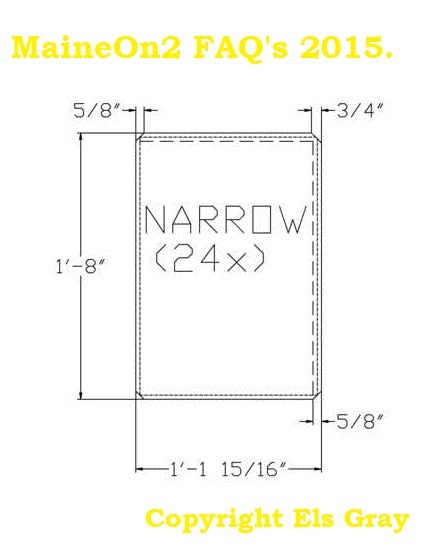 The production quantity is stated in the SRCS Newsletters as being 25 pieces, and the original retail price was $425. According to Mark Hall, he built 38 locomotives and added a builders serial number inscribed into the underside of the rear deck in an area covered by the rear truck. Bob Werner is believed to have assembled the final three units offered for sale, and one of these units does not have such a serial number. 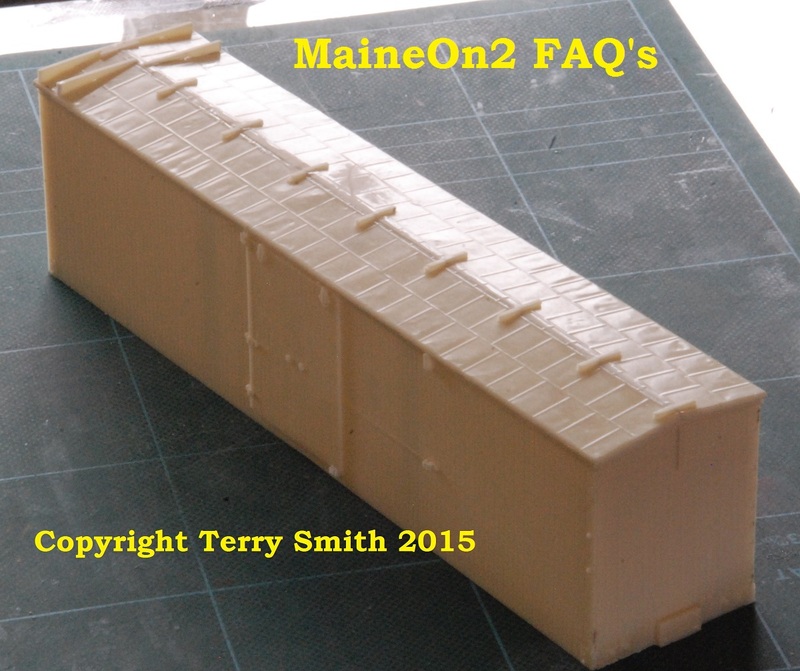 The model had a similar specification to the earlier Putnam & Stowe engines, but had a better build quality. The Sagami can motor was fitted with a small lead flywheel which combined with a properly engineered gearbox gives good running performance. Current owners of this locomotive rated it very highly in the Owners Survey. The rear truck has a novel mounting consisting of a pillar on the engine frame with a vertical spring locating in a cross slot in the truck bolster. This mounting allows the rear truck to slide sideways by .093” each side of centre under friction damping from the spring and allows upwards displacement of the whole truck against the spring pressure. 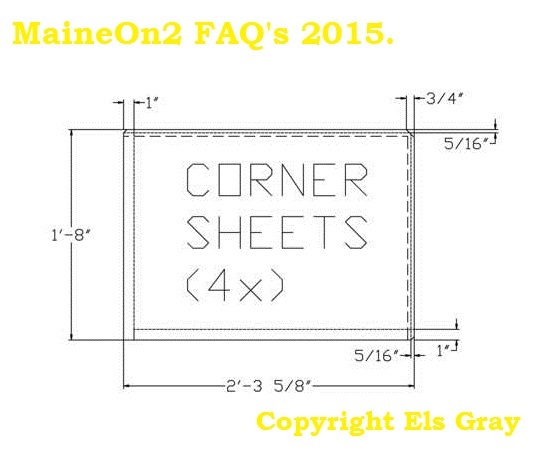 Editors note, 28-12-2014: total production sold is 41 units, according to Mark Hall. The Brass guide lists additional versions (road names and numbers) and suggests that some four batches each of 50 were produced. These are reproduced below for reference only. 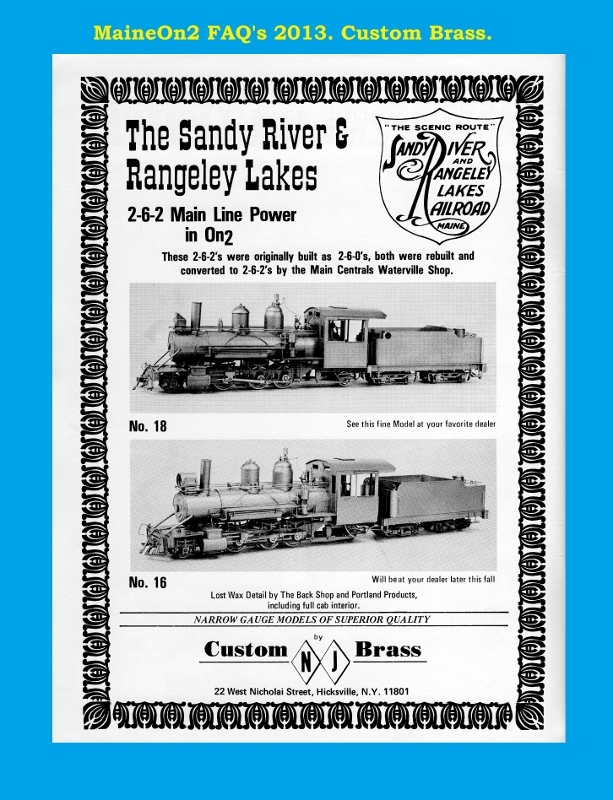 Sadly, the collaboration did not continue with their original intended line of small Forneys, but instead produced an unpowered pilot model of the much larger SR&RL #9 (2-4-4RT), which was on display in the Hobby Barn for some years. This model never went into batch production and was overtaken by the imported offerings from The Car Works. 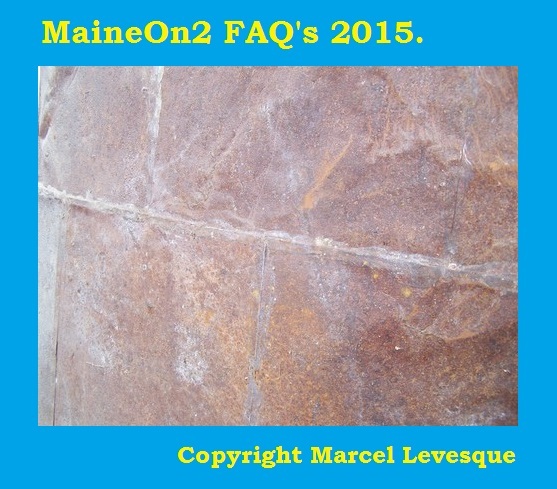 Update 4-January-2014: The Editors have uncovered a posting to the MaineOn2 Yahoo! group written by Ray Christopher in December 2010 which gives some more information, and is reproduced here in it’s original form;- Several models of Hinkley Forneys have been available. 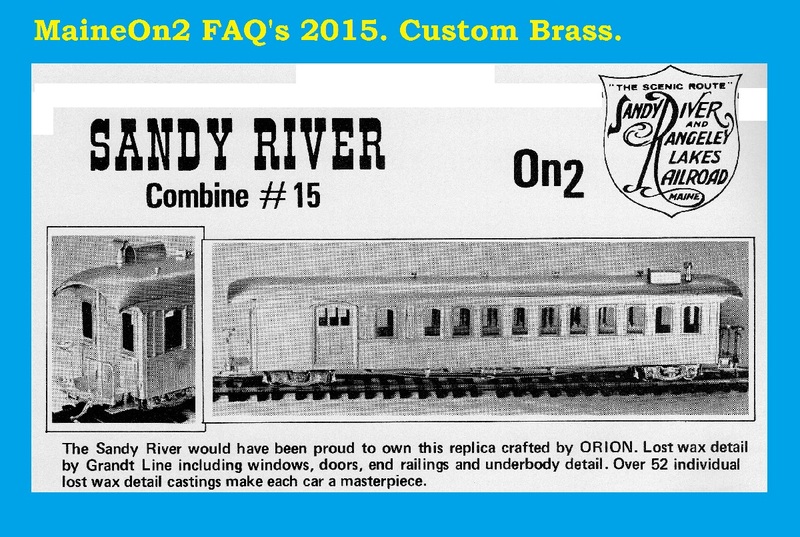 Peter Barney of Sandy River Car Shops released an On2 model of F&M #1 in its later configuration. A photo appears in MTFM #8, January 1987. The article states the model was released by The Forney Company. 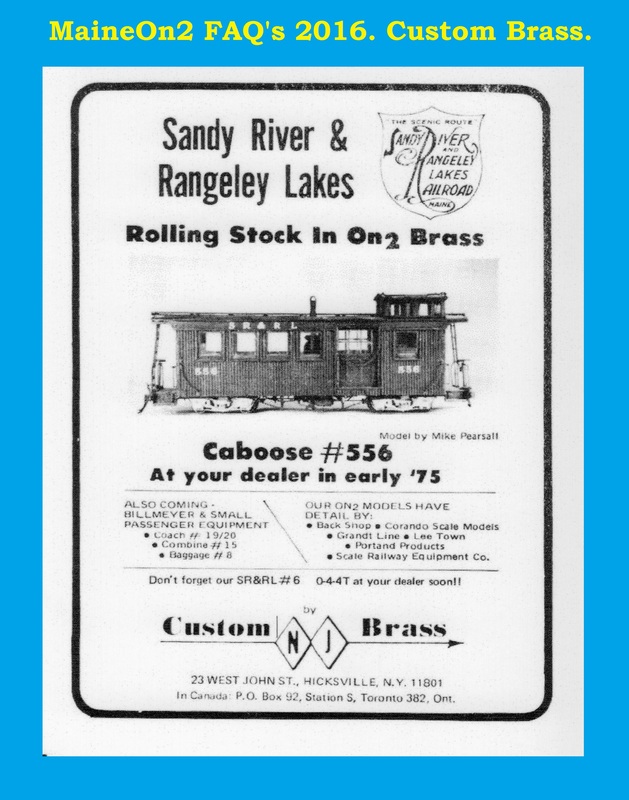 I have one of these models and the box is labelled Sandy River Car Shops. The model was built by Bob Werner. 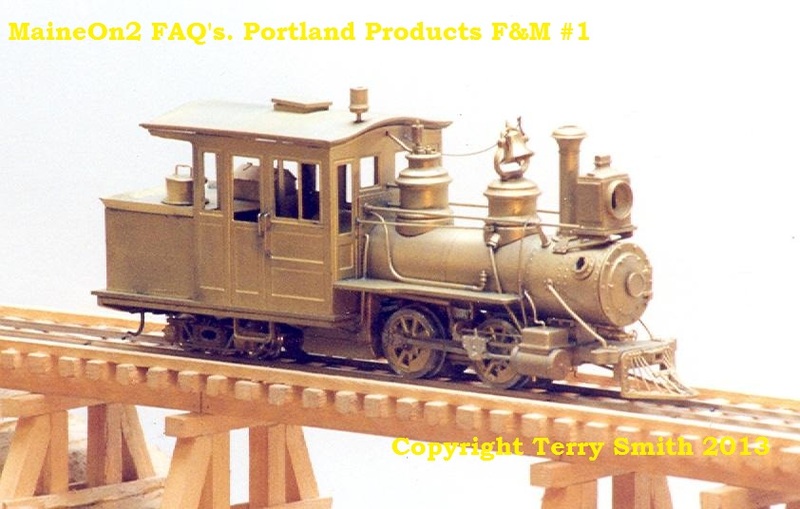 The July 1988 issue of MTFM #16 has an article about a second model of F&M #1 released by Portland Products. The article states this is the same model as the SRCS release with some improvements. 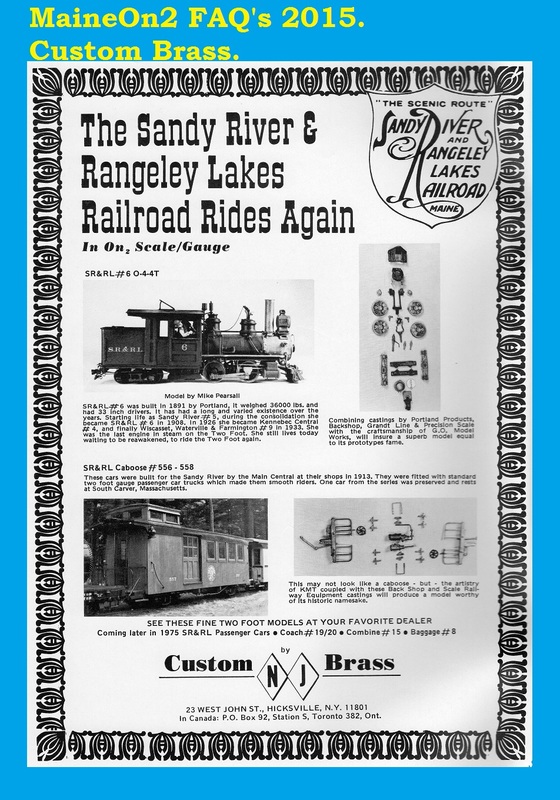 The December 1989 issue of MTFM #23 has an article about Portland Products release of Hinkleys SR#1 and P&R #4. This model of P&R #4 has the correct cab roof for the P&R period. 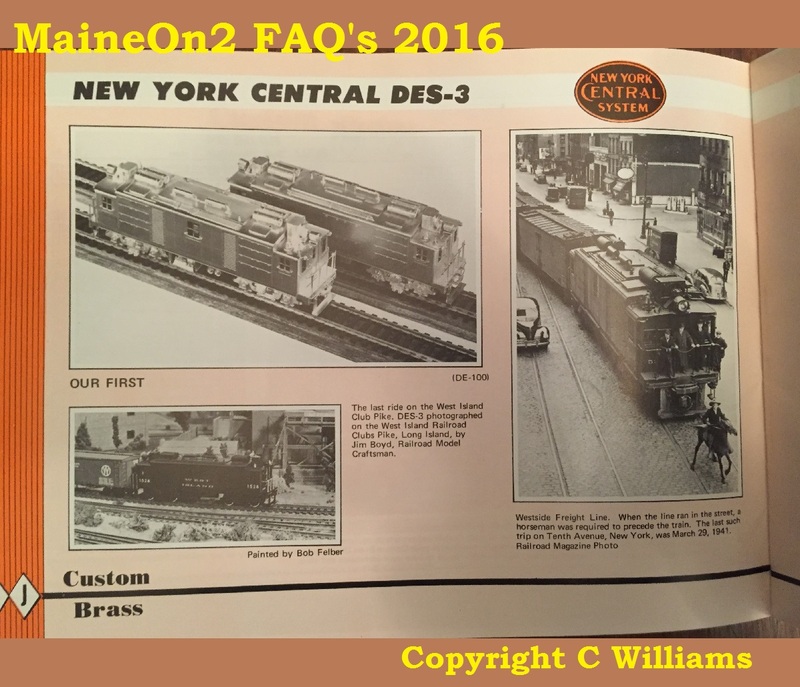 The article also has pictures of Bob’s F&M #1 and the pilot model for SR&RL #9. I have never seen any of these models. If anyone has one please post some pictures. A few other observations. There appears to be two sizes of Hinkley sand domes. SR #1, SR#2, Monson #1 and Monson #2 all had domes shorter than the steam dome. 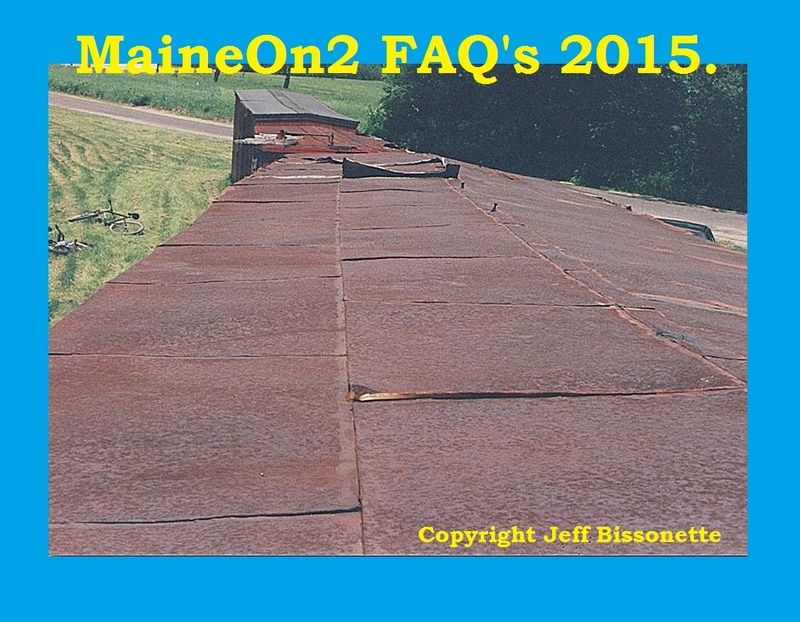 F&M #1, B&SR #1 and B&SR #2 all had domes the same height as the steam dome providing more sand capacity. This is an easy change at the factory as both sizes use the same top and bottom castings. The P&S models have the same size tanks as the Portland locomotives but these are not the original tanks. The larger tanks came after rebuilds that extended the frames and added the larger tanks. The originals were adequate for the B&B but probably inadequate for the longer runs of the growing Franklin County roads. The same sized cabs makes sense. The locomotives increased in size but the people operating them did not. No need to change what already is adequate. 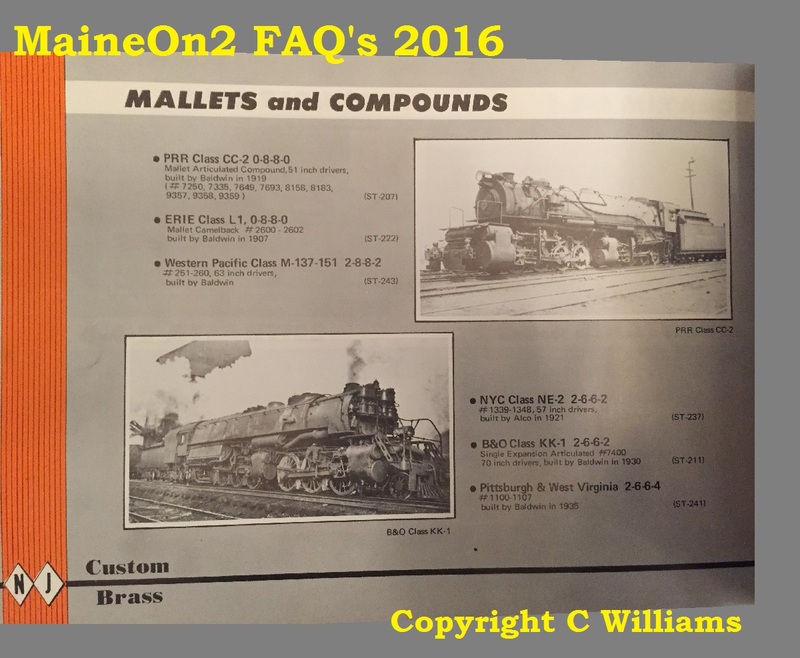 Finally, don’t forget the great article in MTFM #13 by Charlie Siebenthal with drawings showing the evolution of SR #1 and SR #2. Ray Christopher. Update 08-07-2015: Peter Watson’s photograph’s of all four pilot models on his home layout are also shown in the Narrow Gauge & Short Line Gazette, January/February 1990 edition. 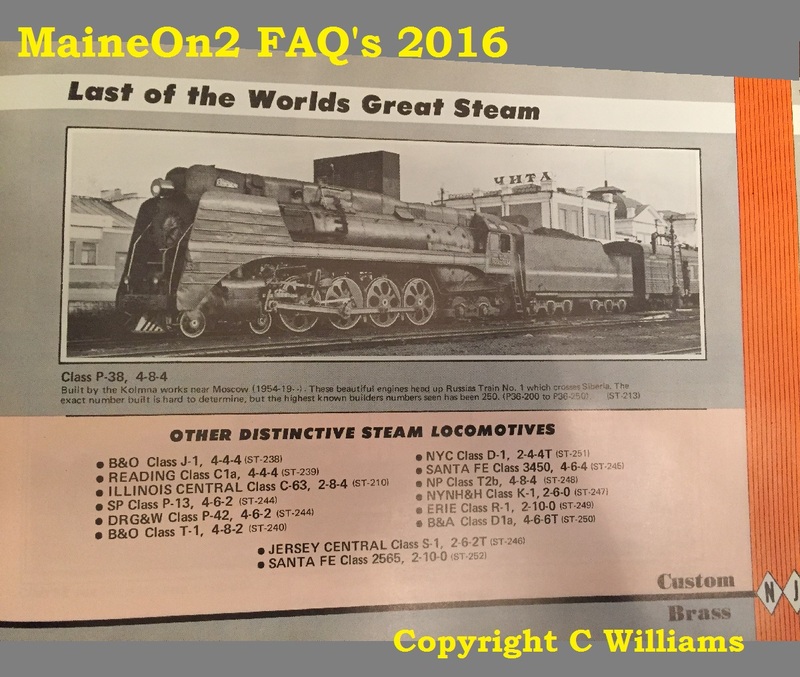 Update 26 January 2014: page six of the Coastal Engineering price list may give a clue to what happened to the proposed range of locomotives. Most probably the pilot models were built, but then insufficient orders/reservations were received (25 required for the photo-etchings, 50 for castings) to allow the models to be produced economically. 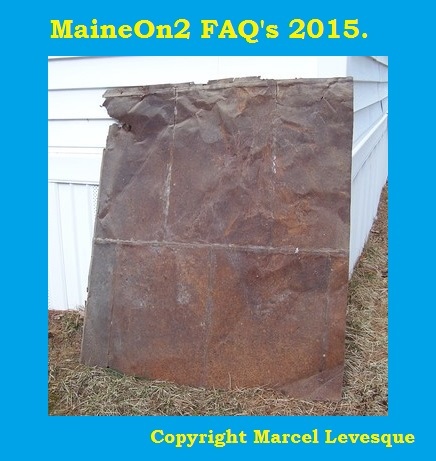 Click here to visit the Portland Products Parts and Coastal Engineering Price list posting. 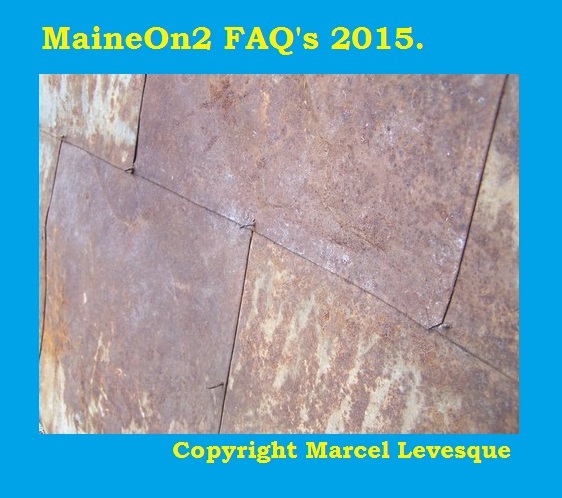 This post was written by Terry Smith with additional information provided by Walter Orloff in 2013 and updated in 2015 with information provided by Mark Hall and Chris Walker.